I get the feeling that this will be the final game I review from Apollo in a very long time, there is only one left for me to review after this and it’s Guardian and I don’t have the 100+ dollars lying around to buy it with. The game I’ll be looking at today is Racquetball, and is the perfect example of a good idea executed poorly. I would also say that Racquetball is also a victim of the 2600 hardware itself, a game this complex simply needed better hardware to power it, probably something around the Colecovision or NES even. Apollo did their best with what they had so let’s take a look at Racquetball (I never thought I’d actually review this one but here we are). This game is quite impressive graphically; it’s second only to Wabbit and the unreleased game Kyphus, this is quite impressive since this was only Apollo’s third game. 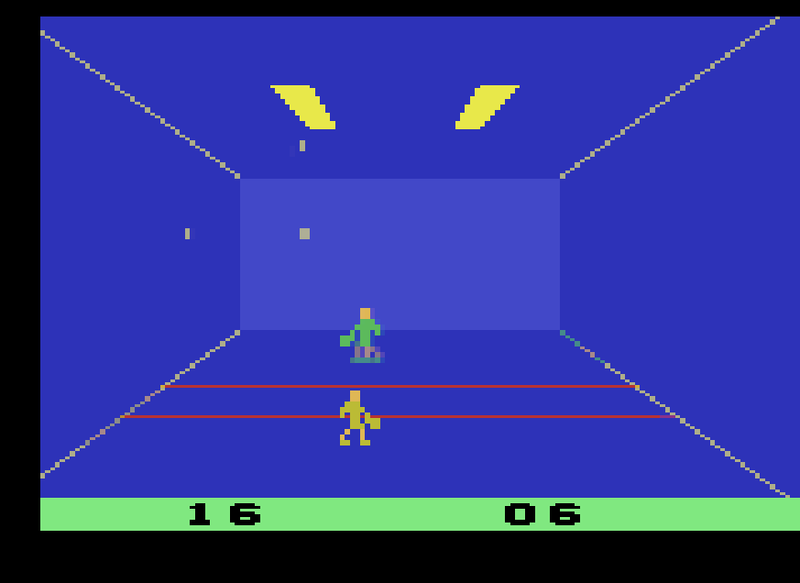 The game takes place in a very blue room, with most of the graphics simply being colored lines which work together to give the impression of three dimensions. The details are quite numerous, a few highlights are the lights on the ceiling, the players having defined clothing (even if player one looks like he’s naked), and there’s a little opening cutscene when the game starts. When you start the game the two players will emerge from a vertically sliding door (don’t ask) and shake each other’s hand before the game begins, little touches like that go a long way towards making the game a unique and fun experience, though Racquetball probably stops at the unique part of that statement. This game will both overwhelm you with sounds and make you fall asleep from the silence. The game opens with a very loud, very jovial, tune that takes no time at all to be annoying; it plays twice in a row. The noises in game are just a bunch of quick blips as the ball hits the walls and ceiling , occasionally the ball will glitch into the wall and the blip will play many times in rapid succession but otherwise the game is very barren. When either the player or computer win the same annoying jovial tune that plays in the beginning will play twice over again one more time. This game is hard to play, but it’s not for a lack of trying. Apollo added small squares onto the walls ceiling and floors to indicate where the ball is located spatially but it comes off as confusing since the ball moves so darn fast. Hitting the ball will only happen by accident since the player is unlikely to have the needed predictive positioning skills to figure out where the ball is going in a three dimensional space. The lack of any scaling removes any depth from the game and only adds to the confusion. A normal game of Racquetball lasts about thirty seconds, you serve to start with, and the computer opponent being a computer will follow the ball almost perfectly, only faltering if the ball has a large amount of horizontal movement, and knows exactly where to go to hit the ball. The player being confused will not know where to move to hit the ball, and after the computer has scored several points on them the player will turn off the game never to play it again. I got lucky and managed to beat the computer by getting the serve into a sweet spot where the computer could never keep up with the ball (too much horizontal movement) and always lose the serve, I didn’t move an inch and kept mashing the serve button. I will at least credit the game with having very consistent and ‘accurate’ ball physics since hitting the ball in the same place at the same angle made it move on the same trajectory every time. The game is over at 21 points, if anybody can even score that many times without cheating like I did. Racquetball is a shelf warmer plain and simple, you’ll buy it, play it once and never play it again. There is a chance that you might play it with friends over but I’d recommend against that since after playing this game they’d likely not be your friends anymore. If you just NEED this game to round off your collection it’ll cost you around $7 for a loose copy and between 10-40 dollars for boxed copies of differing quality. This game goes to the Collector’s Zone for simply being a confusing mess of a game that I can find zero enjoyment from.